Autumn 5 Minute Makeup Drawer. | By Millie. For my base, I like to keep things dewy and simple. I'll go in first with my Becca Backlight Priming Filter which perfects the skin and leaves it looking fresh and glowing. I don't like to faff with foundations, so this is great to add some life back into my face. After that I have to add a concealer or corrector as my under eyes will no doubt be looking dark and puffy. The Charlotte Tilbury Miracle Eye Wand is a great multi-purpose corrector. It has an eye cream on one end to help tighten and brighten then under eyes, then a salmon concealer shade on the other end to counteract blue tones. I find this is all I need to wake up my skin. 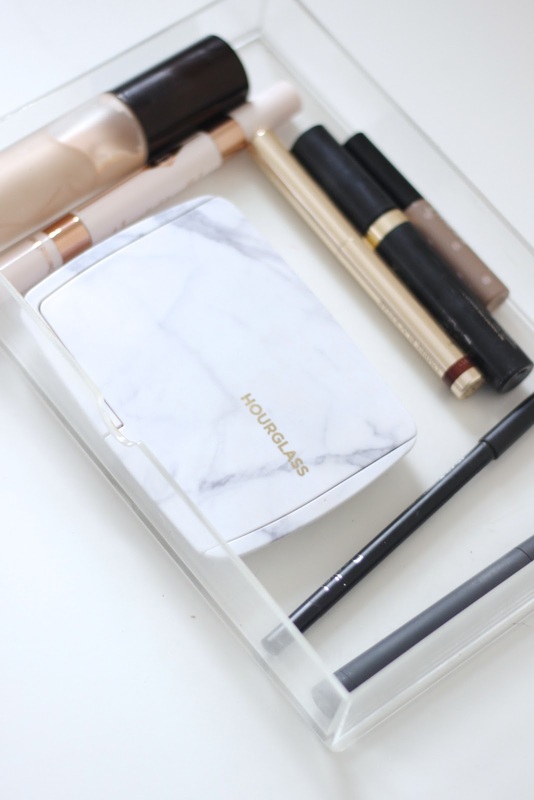 For blusher and bronzer I of course have my Hourglass Surreal Light Palette which has everything your cheekbones could need. I will first take the bronze shade and blend that across the cheeks and forehead to add some colour, before going in with a blush. I love the two blush shades in this palette, one is more peach and one more mauve, perfect for Autumn. I simply swish the two together to give a nice flush of colour. I keep my eyes super simple and quick with a swipe of the By Terry Ombre Black Star in Bronze Moon over the lid then smudge some black liner into my upper lash line. This is a very simple look which doesn't require much effort or skill, you can even use your fingers to blend the two out. I have to curl my lashes and add some mascara, and for that I've been back to using my MAX Factor Masterpiece Mascara which is great for defining the lashes. For my brows I tend to gravitate towards a gel of some sorts. The Benefit Gimme Brow is my favourite as it adds a bit of colour and texture to the brows, as well as keeping them in place all day. Somedays I won't faff with a lipstick, I'll just pop some lip balm on and head out the door. On other days I will go in with a mauve tone which I find finishes the look of nicely and looks like you've tried a bit harder than you actually have. The Bite Beauty Matte Lip Crayon in Pastille is a gorgeous dusty purple pink shade which feels very comfortable on the lips. This is my favourite kind of colour to wear in the Autumn!